Heat oven to 350°F (325°F for dark or nonstick pans). Make, bake and cool cake as directed on box for two 8-inch or 9-inch rounds, or use one 8-inch round pan and one 9-inch round pan. On tray, arrange cake rounds as pictured. Frost with frosting. Sprinkle with coconut, pressing gently so it sticks. Carefully cut black gumdrop for nose and eyebrows, cut green gumdrop for eyes, use licorice for mouth and muffler and chocolate chips for buttons. Place cookie on each side of head for earmuffs; attach across top of head with licorice. Store loosely covered. Make this cake the star of a skating and sliding party! The morning of the party, bake and frost the cake. Save the rest of the decorating for when you and your party guests come in from the cold. 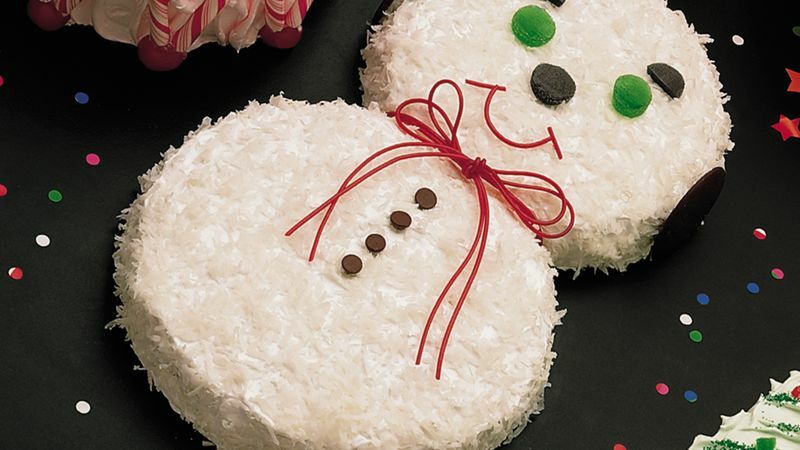 Decorate the smiley snowman as you sip hot chocolate and enjoy Christmas cookies. Just for fun, create a Skating Snowman Cake! Carefully cut a flat-bottom ice cream cone lengthwise in half and use for boots. Place a candy cane under each boot for the skate blade.